"Intelligences born and intelligences made have a lot to offer each other. For that beneficial blend to occur, the contextual framing that the voices in this book spell out will be crucial." 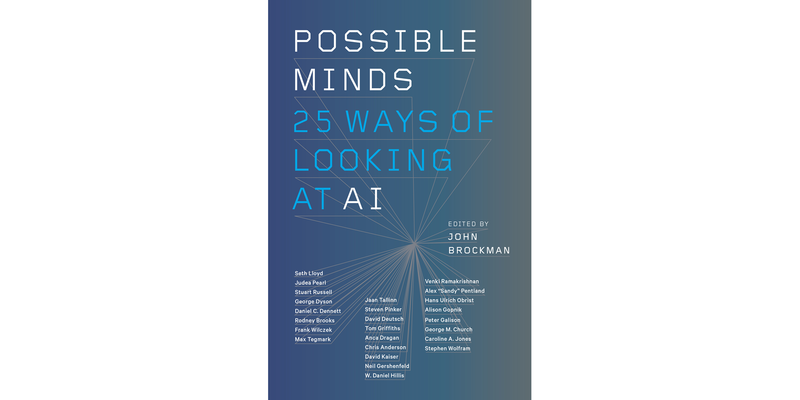 "Brockman, founder of the online salon Edge.org, corrals 25 big brains—ranging from Nobel Prize-winning physicist Frank Wilczek to roboticist extraordinaire Rodney Brooks—to opine on this exhilarating, terrifying future." 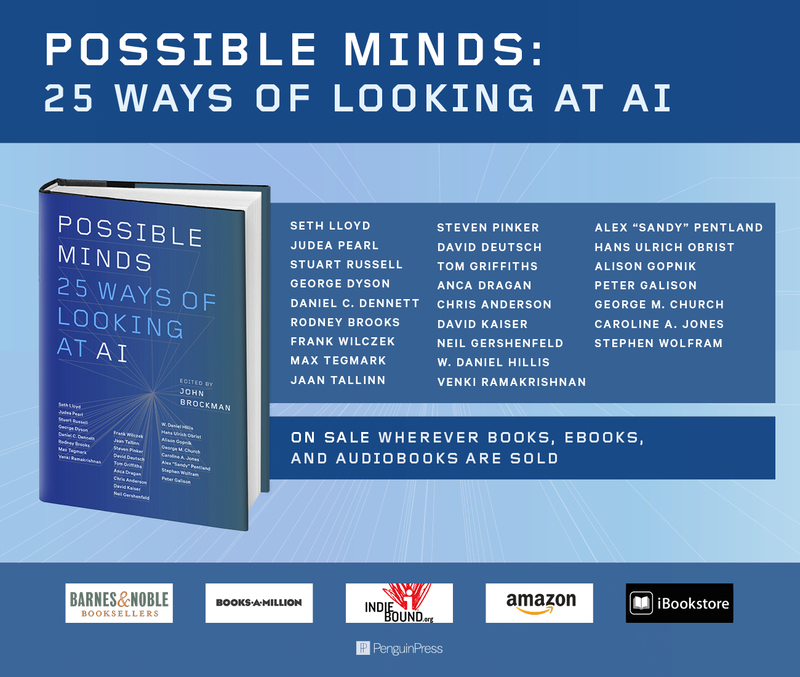 Artificial intelligence is today's story—the story behind all other stories. It is the Second Coming and the Apocalypse at the same time: Good AI versus evil AI. John Brockman is a cultural impresario whose career has encompassed the avant-garde art world, science, books, software, and the Internet. He is the author of By The Late John Brockman and The Third Culture. It is exactly in the extension of the cybernetic idea to human beings that Wiener's conceptions missed their target. Seth Lloyd is a theoretical physicist at MIT, Nam P. Suh Professor in the Department of Mechanical Engineering, and an external professor at the Santa Fe Institute. He is the author of Programming the Universe: A Quantum Computer Scientist Takes on the Cosmos. Deep learning has its own dynamics, it does its own repair and its own optimization, and it gives you the right results most of the time. But when it doesn't, you don't have a clue about what went wrong and what should be fixed. Judea Pearl is professor of computer science and director of the Cognitive Systems Laboratory at UCLA. His most recent book, co-authored with Dana Mackenzie, is The Book of Why: The New Science of Cause and Effect. We may face the prospect of superintelligent machines—their actions by definition unpredictable by us and their imperfectly specified objectives conflicting with our own—whose motivation to preserve their existence in order to achieve those objectives may be insuperable. Stuart Russell is a professor of computer science and Smith-Zadeh Professor in Engineering at UC Berkeley. He is the coauthor (with Peter Norvig) of Artificial Intelligence: A Modern Approach. Any system simple enough to be understandable will not be complicated enough to behave intelligently, while any system complicated enough to behave intelligently will be too complicated to understand. George Dyson is a historian of science and technology and the author of Baidarka: the Kayak, Darwin Among the Machines, Project Orion, and Turing's Cathedral. DANIEL C. DENNETT: WHAT CAN WE DO? We don't need artificial conscious agents. We need intelligent tools. Daniel C. Dennett is University Professor and Austin B. Fletcher Professor of Philosophy and director of the Center for Cognitive Studies at Tufts University. He is the author of a dozen books, including Consciousness Explained, and, most recently, From Bacteria to Bach and Back: The Evolution of Minds. We are in a much more complex situation today than Wiener foresaw, and I am worried that it is much more pernicious than even his worst imagined fears. Rodney Brooks is a computer scientist; Panasonic Professor of Robotics, emeritus, MIT; former director, MIT Computer Science Lab; and former director of the MIT Artificial Intelligence Lab and the MIT Computer Science & Artificial Intelligence Lab (CSAIL). He is the author of Flesh and Machines. The advantages of artificial over natural intelligence appear permanent, while the advantages of natural over artificial intelligence, though substantial at present, appear transient. Frank Wilczek is Herman Feshbach Professor of Physics at MIT, recipient of the 2004 Nobel Prize in physics, and the author of A Beautiful Question: Finding Nature's Deep Design. We should analyze what could go wrong with AI to ensure that it goes right. Max Tegmark is an MIT physicist and AI researcher; president of the Future of Life Institute; scientific director of the Foundational Questions Institute; and the author of Our Mathematical Universe, and Life 3.0: Being Human in the Age of Artificial Intelligence. Continued progress in AI can precipitate a change of cosmic proportions—a runaway process that will likely kill everyone. Jaan Tallinn, a computer programmer, theoretical physicist, and investor, is a co-developer of Skype and Kazaa. There is no law of complex systems that says that intelligent agents must turn into ruthless megalomaniacs. Steven Pinker, a Johnstone Family Professor in the Department of Psychology at Harvard University, is an experimental psychologist who conducts research in visual cognition, psycholinguistics, and social relations. He is the author of eleven books, including The Blank Slate, The Better Angels of Our Nature, and, most recently, Enlightenment Now: The Case for Reason, Science, Humanism, and Progress. Misconceptions about human thinking and human origins are causing corresponding misconceptions about AGI and how it might be created. David Deutsch is a quantum physicist and a member of the Centre for Quantum Computation at the Clarendon Laboratory, Oxford University. He is the author of The Fabric of Reality and The Beginning of Infinity. Automated intelligent systems that will make good inferences about what people want must have good generative models for human behavior. Tom Griffiths is Henry R. Luce Professor of Information, Technology, Consciousness, and Culture at Princeton University. He is co-author (with Brian Christian) of Algorithms to Live By. In the real world, an AI must interact with people and reason about them. People will have to formally enter the AI problem definition somewhere. Anca Dragan is an assistant professor in the Department of Electrical Engineering and Computer Sciences at UC Berkeley. She co-founded and serves on the steering committee for the Berkeley AI Research (BAIR) Lab and is a co-principal investigator in Berkeley's Center for Human-Compatible AI. Just because AI systems sometimes end up in local minima, don't conclude that this makes them any less like life. Humans—indeed, probably all life-forms—are often stuck in local minima. Chris Anderson is an entrepreneur; a roboticist; former editor-in-chief of Wired; co-founder and CEO of 3DR. His books include The Long Tail, Free, and Makers. Many of the central arguments in The Human Use of Human Beings seem closer to the 19th century than the 21st. Wiener seems not to have fully embraced Shannon's notion of information as consisting of irreducible, meaning-free bits. David Kaiser is Germeshausen Professor of the History of Science and professor of physics at MIT, and head of its Program in Science, Technology & Society. He is the author of How the Hippies Saved Physics: Science, Counterculture, and the Quantum Revival and American Physics and the Cold War Bubble (forthcoming). Although machine making and machine thinking might appear to be unrelated trends, they lie in each other's futures. Neil Gershenfeld is a physicist and director of MIT's Center for Bits and Atoms. He is the founder of the global fab lab network, the author of FAB, and co-author (with Alan Gershenfeld & Joel Cutcher-Gershenfeld) of Designing Reality. Hybrid superintelligences such as nation states and corporations have their own emergent goals and their actions are not always aligned to the interests of the people who created them. W. Daniel "Danny" Hillis is an inventor, entrepreneur, and computer scientist, Judge Widney Professor of Engineering and Medicine at USC, and author of The Pattern on the Stone: The Simple Ideas That Make Computers Work. VENKI RAMAKRISHNAN: WILL COMPUTERS BECOME OUR OVERLORDS? Our fears about AI reflect the belief that our intelligence is what makes us special. Venki Ramakrishnan is a scientist at the Medical Research Council Laboratory of Molecular Biology, Cambridge University; recipient of the Nobel Prize in Chemistry (2009); current president of the Royal Society; and the author of Gene Machine: The Race to Discover the Secrets of the Ribosome. How can we make a good human-artificial ecosystem, something that's not a machine society but a cyberculture in which we can all live as humans—a culture with a human feel to it? Alex "Sandy" Pentland is Toshiba Professor and professor of media arts and sciences, MIT; director of the Human Dynamics and Connection Science labs and the Media Lab Entrepreneurship Program, and the author of Social Physics. Many contemporary artists are articulating various doubts about the promises of AI and reminding us not to associate the term "artificial intelligence" solely with positive outcomes. Hans Ulrich Obrist is artistic director of the Serpentine Gallery, London, and the author of Ways of Curating and Lives of the Artists, Lives of the Architects. Looking at what children do may give programmers useful hints about directions for computer learning. Alison Gopnik is a developmental psychologist at UC Berkeley; her books include The Philosophical Baby and, most recently, The Gardener and the Carpenter: What the New Science of Child Development Tells Us About the Relationship Between Parents and Children. By now, the legal, ethical, formal, and economic dimensions of algorithms are all quasi-infinite. Peter Galison is a science historian, Joseph Pellegrino University Professor and co-founder of the Black Hole Initiative at Harvard University, and the author of Einstein's Clocks and Poincaré's Maps: Empires of Time. Probably we should be less concerned about us-versus-them and more concerned about the rights of all sentients in the face of an emerging unprecedented diversity of minds. George M. Church is Robert Winthrop Professor of Genetics at Harvard Medical School; Professor of Health Sciences and Technology, Harvard-MIT; and co-author (with Ed Regis) of Regenesis: How Synthetic Biology Will Reinvent Nature and Ourselves. The work of cybernetically inclined artists concerns the emergent behaviors of life that elude AI in its current condition. Caroline A. Jones is a professor of art history in the Department of Architecture at MIT and author of Eyesight Alone: Clement Greenberg's Modernism and the Bureaucratization of the Senses; Machine in the Studio: Constructing the Postwar American Artist; and The Global Work of Art. The most dramatic discontinuity will surely be when we achieve effective human immortality. Whether this will be achieved biologically or digitally isn't clear, but inevitably it will be achieved. Stephen Wolfram is a scientist, inventor, and the founder and CEO of Wolfram Research. 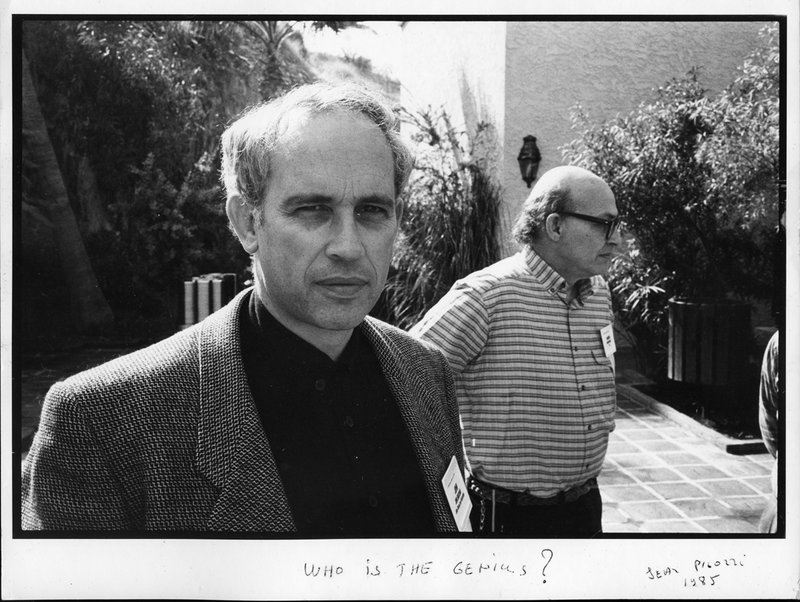 He is the creator of the symbolic computation program Mathematica and its programming language, Wolfram Language, as well as the knowledge engine Wolfram|Alpha. He is also the author of A New Kind of Science.